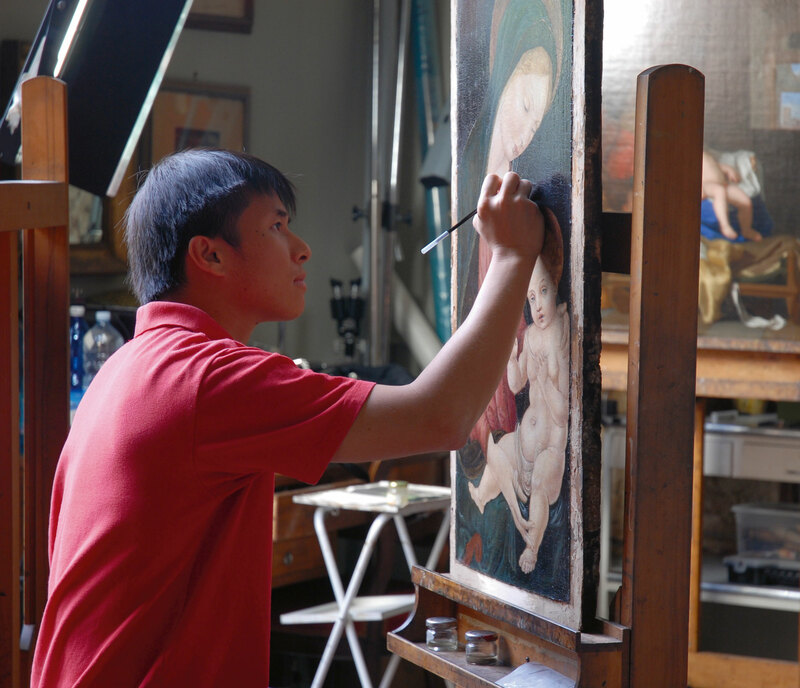 Leo Tsai, who lived in Europe and the US for nearly ten years, learned Western art restoration concepts and techniques before returning to Taiwan. 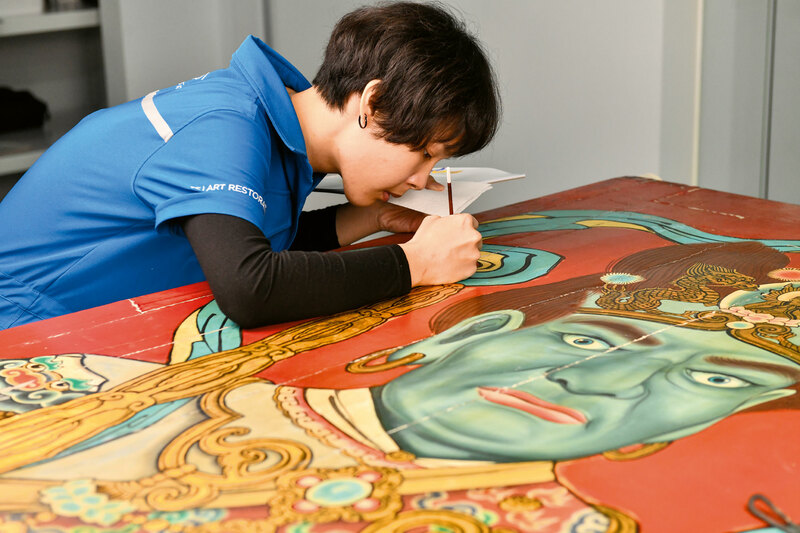 He has partici­pated in the restoration of temple artworks by traditional painters including Pan Li-shui (1914‡1995), Ko Huan-jang (1901‡1972), Chen Yu-feng (1900‡1964), and Chen Shou-yi (1934‡2012), uncovering the refined and enchanting worlds produced by these masters in days gone by. 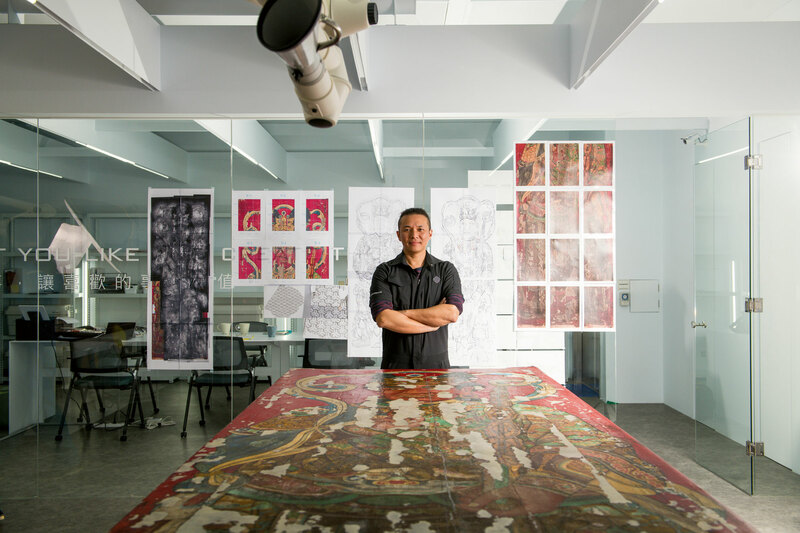 Each piece has been beautifully transformed by his craftsmanship, which restored the original ap­pear­ance of these cultural artifacts while preserving the marks of their tempering by the passage of time, thereby allowing the next generation to see first-hand the homegrown Taiwanese art of temple painting. “I feel for Doraemon. He often has to take the hapless No­bita Nobi back in time on his time machine. The problem he faces is that of going back in time, and mine is the same,” says Leo Tsai, selecting a humorous analogy for the work of an art conservator. When Tsai was studying in the Department of Fine Arts at Tung­hai University, some of his own paintings got damaged, which gave him the idea to go and study at the Institute for Art and Restoration (Palazzo Spinelli) in Florence, Italy. While taking classes there, despite not being able to speak much Italian he went door to door looking for someone to take him on as an apprentice at a restora­tion workshop, asking only the opportunity to do more hands-on restoration work. After entering the studio of the internationally famous oil painting conservator Stefano Scarpelli, he was able to proceed to the Uffizi Gallery, where he worked on restoring paintings by Giotto di Bondone, considered the father of the Renaissance. Despite his impressive resumé, Tsai ultimately decided to return to Taiwan, where he founded TSJ Art Restoration. Before specialized restoration techniques were introduced into Taiwan, traditional temples mainly hired ar­tisans or artists to handle “restoration” work. However, this was less restoration than repainting the work, and once the brush had passed over the piece, the former art was covered up, and the feeling created by the passage of time was swept away. Later, the appealing but misguided notion of “restoring old objects to their old appearance” also caused damage to cultural assets. “Time is ruthless. Materials will age, paint will change or fade. These changes are all caused by the passage of time, yet only with the tempering of time can good things appear,” says Tsai. The duty of a conservator is to apply their knowledge of art history and their understanding of materials to carefully clean impurities off the surface, consolidate the original paint where it has begun to flake, and fill and retouch the areas where the paint has been lost, returning the artifact to its original appearance while preserving the evidence of the passage of time. In Taiwanese temples, besides being exposed to a hot, humid climate, the paintings are often covered by a thick layer of greasy dirt from the burning of incense and candles. When you add in the habit of only initiating restoration after works show obvious signs of damage, the door god paintings that come into Tsai’s hands are mostly in a parlous state, peeling and mottled and on the verge of being irreparable. But no matter how challenging the task, the TSJ team members always study the work in great detail to prepare for the task ahead. They first use solvents to carefully clean the work, and then, advancing millimeter by millimeter, they use a scalpel to carefully scrape off the dirt, and any paint that has been applied by repainting over the original work. Next they use filler to consolidate the existing paint, and use brushes to carefully paint color into areas where the paint has been lost, returning the door god to its former luster and radiance. It’s amazing how they can restore even the fine lines (less than 1 mm thick) of the door gods’ beards and whiskers strand by strand to vivid elegance. Setting such high standards means that “many people surely sense that the bar is gradually being raised. But if you don’t do this, the victims are the artifacts and artworks,” says Tsai earnestly. Because the success of restora­tion is determined within areas of a single square centi­meter, the use of any inappropriate procedures or materials can cause irreparable harm to the artifact. Quality comes from skills and technology, but also from meticulous attention to detail. Tsai has personally trained his own team. At the routine video­conferences between his firm’s northern and southern branches every morning at nine, he sincerely reminds the conservators what details they must look out for in each of the restoration procedures to be conducted that day. 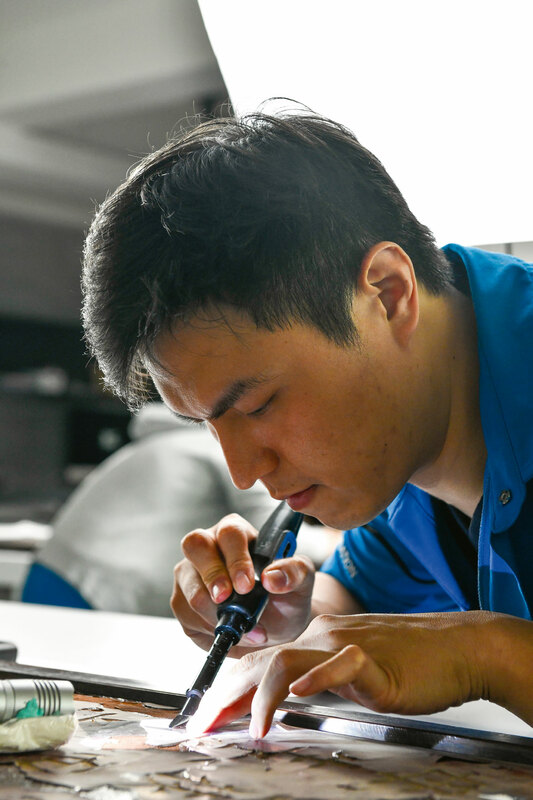 During our visit, Tsai periodically checks out the situation in the restoration studio, and if any member of his team has questions or concerns, Tsai goes over and explains, or even directly takes the tools in hand to demonstrate the proper approach. Tsai sets high standards and requires his team members to work hard to meet those standards, but he also periodically gives pep talks to his team, to build up their confidence in their own skills and their pride in their profession. The Tai­nan headquarters of TSJ Art Restoration has not been in operation long. Tsai invited Lab B Design Company to work with him to design and build the workspace. Everywhere you can see his meticulous attention to the details of restoration work, from the temperature and humidity controls and ventilation system to the fully stocked laboratory with its paints and solvents. He fastidi­ously requires that the working environment be neat and well-kept, with methods and rules for everything from binding electrical cables to putting away equipment and materials. He quips that whenever he shares photos of the workshop on Instagram, every photo looks good, because this is what it means to be professional. He is familiar with the costs, techniques, and know­ledge behind every brushstroke in the restoration process, and he also understands that ultimately, art services can only survive by taking account of market forces. 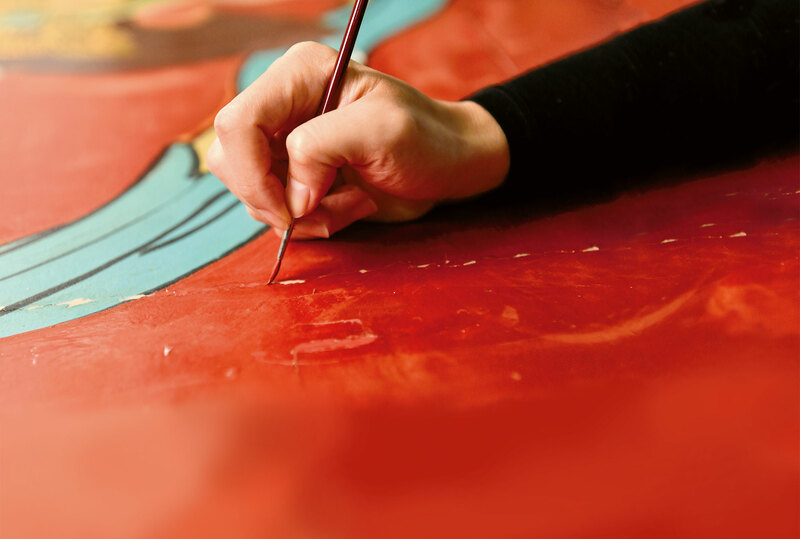 Therefore, most restoration projects in Taiwan are still handled as one-off contracts, limited by the time and funds available to the art owner. Tsai is already thinking about what business model will keep his company afloat. He has hired a designer to redesign the TSJ logo and corporate identity, and he has participated in the design of new company uniforms to highlight the profession­al­ism of his team. Each day he forces ­himself to read heavyweight books on subjects outside his discip­line (such as management or financial reporting), con­sider­ing these to be required subjects for managers. The concept of restoration that largely prevails in Taiwan is still stuck within a mindset of not initiating conserva­tion until a work has badly deteriorated, and doing nothing to maintain works in good condition after they are restored. 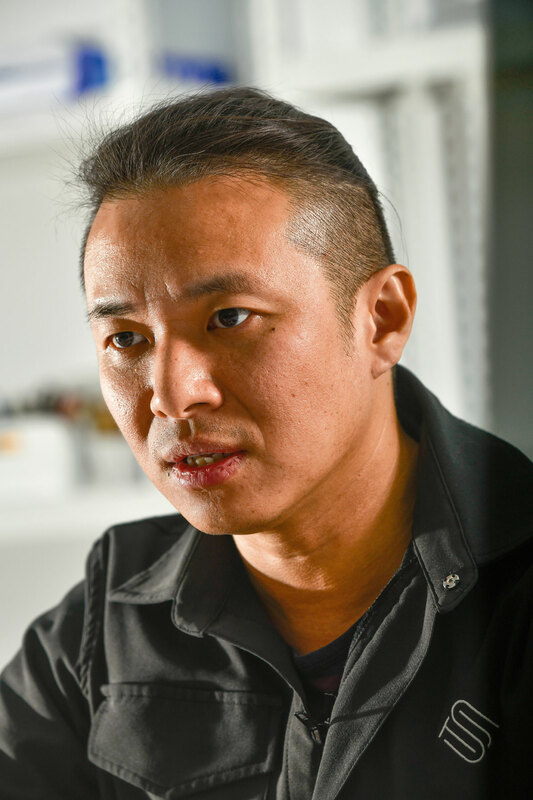 Tsai is already far ahead of his competi­tors, and he plans on making TSJ Asia’s largest and best-known restoration company, providing services that include storage, restoration, transportation, installation, and display. 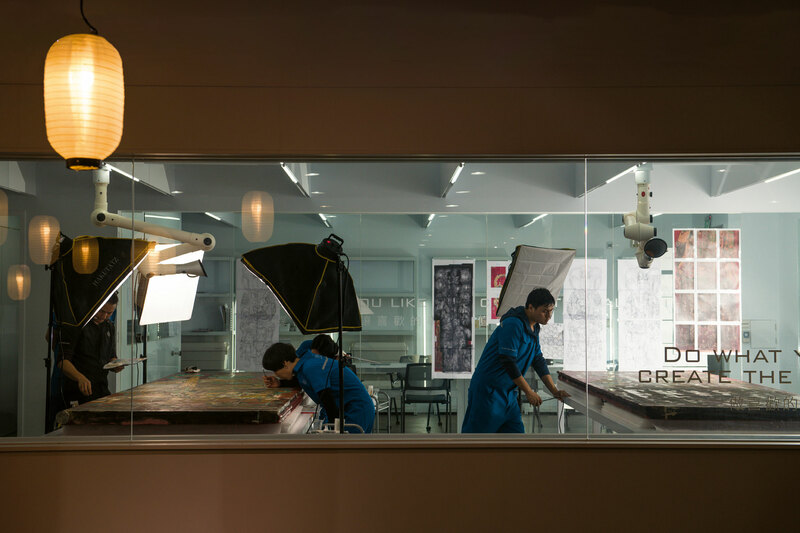 Tsai’s expectations for his team are inscribed on glass in the restoration studio: “Do what you like and create the value.” Value refers not only to the significance of preserving cultural assets, but also to commercial profit­ability, which is key to restoration work’s long-term ­viability. “What I really want to do is to enable these things [door god paintings] to one day take their rightful place and be seen in art museums,” says Tsai. Knowledge of Taiwan’s native culture has long been inadequate. While the art history of Taiwan is still in a phase of uncertainty, determination of what is art lies in the hands of academic experts. But without theoret­ical under­pinnings, the question of whether the works created by temple artists are genuinely “art” is still under discussion. Leo Tsai and the TSJ team, with the support of owners, aim to keep these artifacts around for the next 20 years. They want the next generation to have the chance to ap­preci­ate these masterpieces and get to know Taiwan’s homegrown temple art, rather than waiting until these arti­facts are badly deteriorated, and all that is left is regrets. “I hope that one day the children of Taiwan will be able to say who their favorite Taiwanese artist is,” says Tsai. This question, to which virtually anyone in Europe can give an answer, is still hard for people in Taiwan to respond to because art education is comparatively weak. In 2018, Tsai accepted a commission from Long­shan Temple in Tai­pei’s Wan­hua District to restore the door god paintings on the doors of the temple’s front hall. The paintings were made by the master artist Chen Shou-yi, who completed the work in 1966. But through the impact of moisture, sunlight, and incense smoke, the paintings have suffered varying degrees of damage. 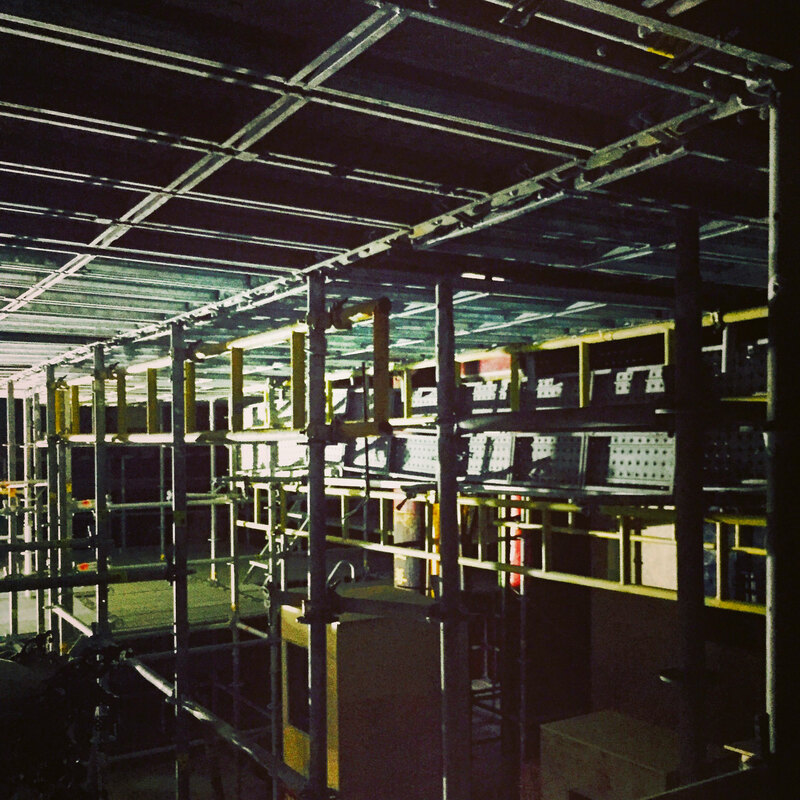 Here in the cradle of Tai­pei’s history, in a space where people come and go, you see the TSJ team hunkered down in the restoration center installed in the temple’s basement. There they quietly concentrate on their work under the lighting, heads down and backs bent, engaged in a dialogue with time. It is time that makes classics out of cultural artifacts. The TSJ team, meanwhile, are devoting their youths to extending the lives of these artifacts, in an endless tug of war with time. They are conservators who travel back in time.